I read this article and found it very interesting, thought it might be something for you. The article is called Increase running cadence – Will it help to run faster? – Data Thursday and is located at https://runfastacademy.com/increase-running-cadence-will-help-run-faster-data-thursday/. Many runners believe that by increasing the cadence they will be able to run faster. I used to believe the same, however, in reality that is not the case. When I was attending the Garmin running coach certified class in July 2017, Coach Hsu Kuo Feng demonstrated this theory to us in the class. He asked one of the student to jog on the spot, starting from 180spm, 190spm, 200spm till 220spm. And yet, the student is still in the same spot. This demo proved that you need to fall in some angle in order to be able to move forward. When you start to move forward, then the cadence kick will help on the change support. With that we are only able to have movement. 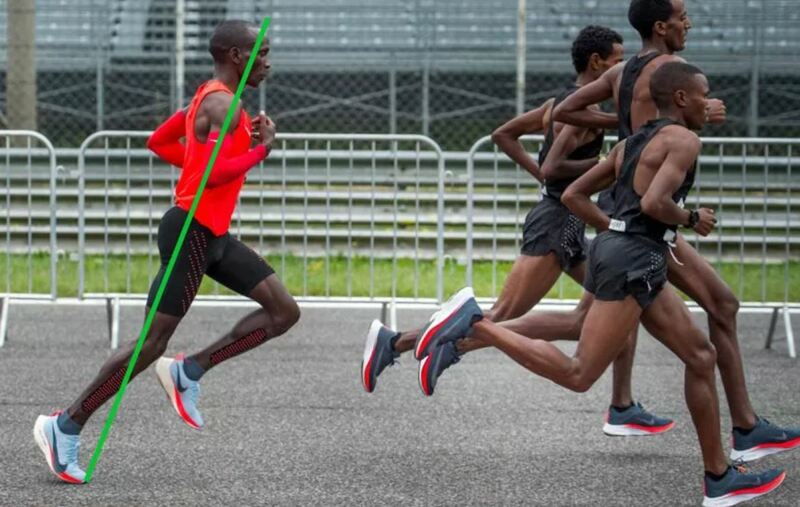 In above equation, you will see that in order to run faster, you will need to combine the stride length and cadence to achieve speed. In Pose Method of running we use the falling to get the maximum stride length. The maximum angle we can fall is 0-22.5°. Running sequence of Usain Bolt, please disregard the degrees and markers. Image courtesy of Russian Track and Field Magazine. Usain Bolt and Tyson Gay in the final 100m of World Championship in Berlin. Bolt’s calculated average angle in 100m with the time 9.58 seconds was 18.5 degrees with the average step frequency (cadence) 4.28 steps per second (257 steps per minute), and Gay’s, with the time 9.71 seconds – 18.4 degrees, and step frequency (cadence) 4.68 steps per second (281 steps per minute). This report shows that high cadence doesn’t mean you will run faster, but with falling angle yes you are able to achieve that. Eliud Kipchoge his cadence was a very good average for a marathon but a slight increase in cadence would have made a big difference. Time: 2:00:25, average speed 5.84m/c, average pace per km – 2:51.2; average 10km – 28:32. At start of the race (36 seconds): cadence was 185s/m-3.08s/s, SL – 1.90m; AngleF(AF) – 17.5 deg. From first minutes into the race and to Finish stretch average cadence was around 185s/m – 3.08s/s, SL – 1.90m; AF – 17.5 deg. Analyzing support time by frames, I found out that it was stable over the length of the race – 2 frames to Pose from touchdown and 1 frame for falling (from Pose to the end of support). End of support consistently appears in running Pose (swing foot near the knee of support leg – figure # 4).